The European Union is an impressively democratic organisation which has found an effective way to balance a directly-elected European Parliament and the democratically-elected governments of the nation states. This is the opposite of what the supporters of Brexit are claiming. The basic structure of the EU can be traced back to the formation of the Coal and Steel Community in 1951. What has grown up is a very balanced and highly democratic process which balances the democratic voice of the peoples of Europe in a nuanced and effective way. 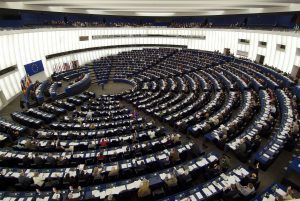 The 751-member European Parliament is directly elected by the citizens of the EU. The Council of Ministers comprises ministers from each of the democratically-elected governments in the nation states, with a voting system that avoids either the large nations or the small ones having a strangle-hold — but requires everyone to agree on some things, such as the decision to let new states join the EU. The European Commission consists of Commissioners appointed by the nation states and confirmed in their roles by the European Parliament. The Committee of the Regions has the right to be consulted on various things, and brings together people elected with regional responsibilities — those sent from the UK are typically elected councillors. Balancing these different groups was a masterpiece of organisational design and gives an impressive degree of democratic oversight. Exchanging information on criminal records of non-EU nationals. So far, so impressive. In fact, I wonder how many of the proponents of Brexit would revise their opinion of the European Parliament if they knew what it was actually doing. This is not to say that the EU can’t be improved: from the beginning the thinking has always been around continued improvement and it would be strange for that to stop. But the foundations are good, and one of the less-sung achievements of the EU is not just democracy within its own organisations, but also working to pull countries that want to join (like Turkey) in the direction of a stable democracy, and applying pressure, as has happened recently in Hungary and Poland, when regimes inside the EU seem to lurch in an authoritarian and less-than-democratic direction. David Cameron’s renegotiation actually took place in a special form of the Council of Ministers — termed the European Council when it is a meeting of the national leaders. The agreement was then discussed by the European Parliament, and I was struck to hear Nigel Farage describe this as “undemocratic”. It is a strange definition of democracy that can brand as “undemocratic” the passing of something to an elected parliament. By contrast with the EU, British democracy does leave something to be desired: an unelected House of Lords, a House of Commons elected on a voting system which means seats held and numbers of votes cast are badly out of step, devolition to Scotland, Wales and Northern Ireland but not to England, and local councils subject to the heavy controlling hand of Westminster, particularly on their budgets. This feels more as if the Brexiteers’ take “undemocratic” to mean “outside their control” which is the point of democracy. People do talk of a “democratic deficit” in the EU which is not to do with how it is constituted, but reflects poor turnout in elections to the European parliament, and the tendency of national media to not engage with what is happening in Brussels at the depth they engage with domestic politics. The way to change that is for us, the electorate, to vote, and to demand that our media engage more fully with the EU. 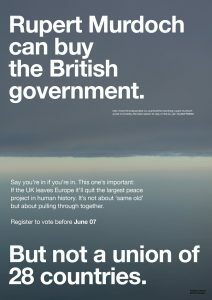 A card by the artist Wolfgang Tillmans acidly suggests that Rupert Murdoch dislikes the EU because it is harder to buy 28 governments than the British one. That may be a little harsh, but it is a little extreme to suggest that British democracy is best. And as another way to address the perceived democratic deficit, the Alliance of Liberals and Democrats for Europe has gone from being a block in the European parliament to a pan-EU political party. This means I am proud to be both a member of the Liberal Democrats and of ALDE, and will be voting for an ALDE/LibDem MEP in the next elections to the European Parliament (assuming the referendum goes the right way). ALDE is exceptional in my mind for the way it seeks to work with the needs of the peoples of Europe for the benefit of as all. On the doorsteps I have heard the term “undemocratic” used to mean “we elect a government, and the EU doesn’t do what our elected government says”. I am using the term paranoid because this treats the rest of the EU as alien and a threat. This is not about “them” controlling “us”. The decisions which need to be made at European level are the ones where we all gain by working together, and there is ample democratic engagement in the process. If we insisted on doing things our own way, that is the opposite of what builds up peaceful co-existence. with one set of regulations, and not 28 sets of regulations, one for each EU member state.